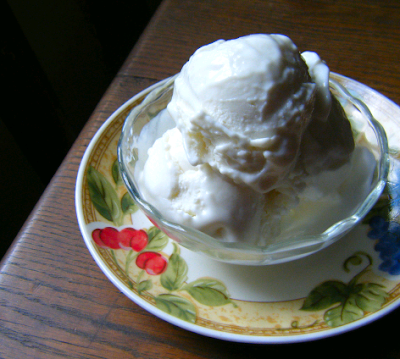 Sugar-Free Vanilla Ice Cream + the Comprehensive Alternative Sweeteners Information Post! As promised, here’s my printable guide and Question and Answer post for baking with sugar-free sweeteners! Thank you for submitting your sugar-free baking questions through Facebook and email. 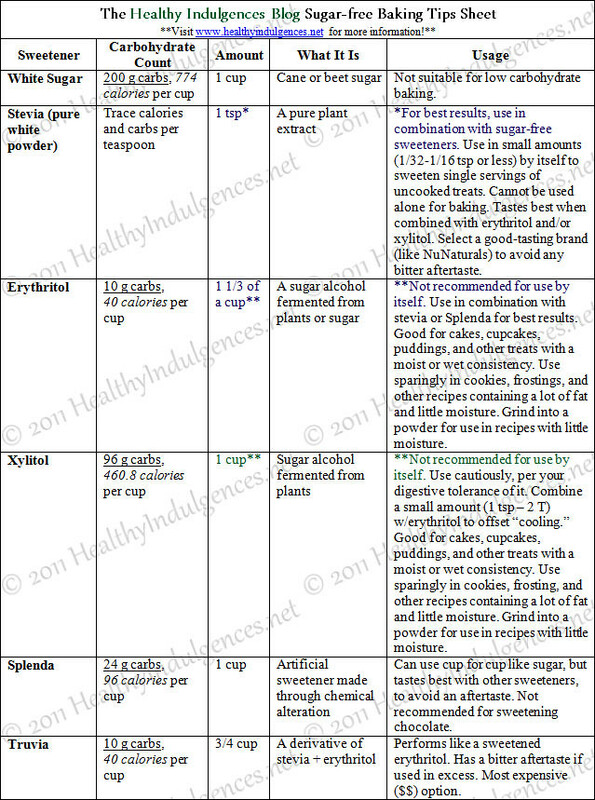 I created this sugar-free baking tips sheet with reminders of how you use sugar-free natural sweeteners and a couple of widely available low carb artificial sweeteners. Feel free to post this chart on your own website, or link back to the chart as a reference. The more people who have access to information explaining how to use these healthy sweeteners, the better! I’ll update the body of this post (not the comments) with answers as more questions come in. You are welcome to provide your own feedback and answers to questions in the comments. I’d love to hear about your experiences with sugar-free baking, and any information you might have to add! Hopefully we can all collaborate to make this a helpful post for both fledgling and veteran sugar-free bakers. I busted out my little Cuisinart and produced an ice cream worthy to share with you guys. With a little bit of inspiration from All Recipes (love this site! ), we now have a viable alternative to storebought low carb ice cream that’s gluten-free and made with fresh ingredients. No sorbitol or maltitol, yuck. The best part about this ice cream is that it’s scoopable right from the freezer. The secret ingredients that make this possible are the heavy cream (as opposed to using part milk or half and half) and the tiny bit of brandy that lowers the freezing point. 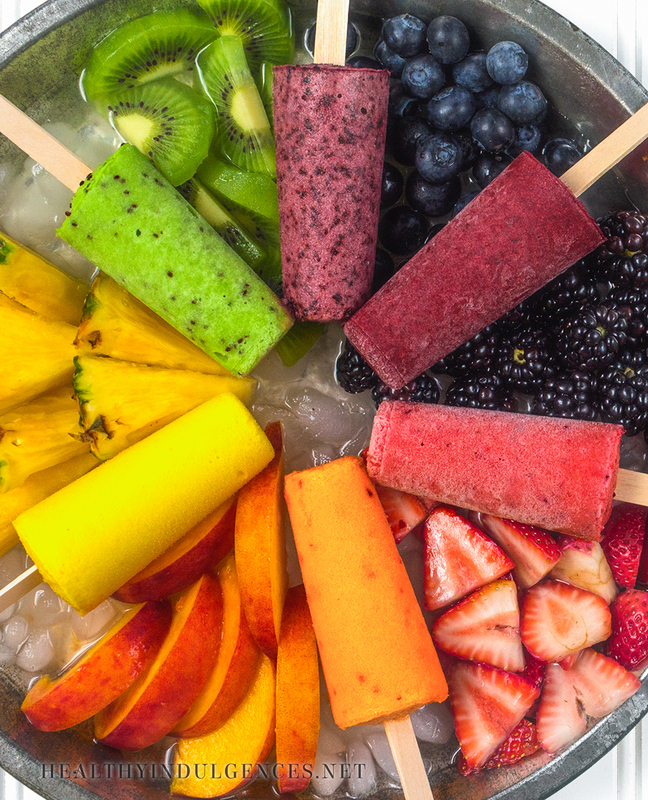 Now you won’t have to wait around to dig into your healthy indulgence on a hot summer day! Furthermore, this creamy custard ice cream doesn’t require any cooking time. Because the ice cream contains raw egg yolks, use only fresh organic eggs. I honestly use conventional storebought eggs every time I make desserts, and have never gotten sick, but you might want to take this precaution if you have a compromised immune system. Additionally, you can find pasteurized eggs in some supermarkets that have already been heat treated for safe culinary use. If you haven’t tried using fresh vanilla beans in your cooking, you might want to give them a try. I ordered them off of ebay for a very reasonable price, and have been using them in low carb custards and pastries ever since. The aromatic floral nature of the tahitian beans and bean pods adds a layer of complexity and richness you can’t get from a bottle. Plus, the pod scrapings add those pretty dark flecks to the ice cream base. Order some today, and you won’t be disappointed. Still working on a dairy-free ice cream. Stay tuned. This low carb, gluten-free treat is so rich and creamy you won’t miss the sugar! Melt granulated sweetener in a saucepan over medium-low heat, and add vanilla bean scrapings and bean pods (if using). Let the sweetener melt into a liquid. Whisk in cocoa powder, 1/4 cup heavy cream, and vanilla bean pieces. Stir until sweetener dissolves, with no grainy chunks visible. Remove saucepan from heat. In a large bowl, beat yolks with electric mixer until light in color. Add the rest of the heavy cream a little at a time, mixing well after each addition. Add cocoa mixture into yolk mixture, and beat well. Whisk in stevia, xanthan gum and vanilla extract, if using. Taste, and add more stevia, if necessary. Chill ice cream base in refrigerator for a minimum of four hours, covered in plastic wrap. Turn on your ice cream maker and strain the base through a fine mesh sieve into your machine to remove the vanilla bean pieces. 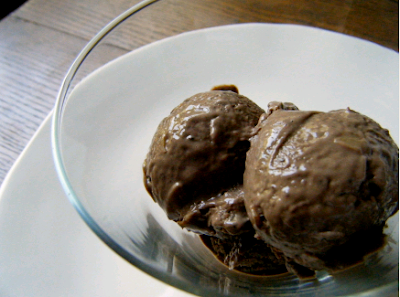 While the ice cream is freezing, make up the sugar-free chocolate chips. Freeze ice cream for a few hours to make it firm and scoopable. Powder sweetener finely in a coffee grinder. Melt chocolate and coconut oil in microwave for 1 minute, stirring after 30 seconds. Stir again until smooth, and add xylitol and stevia. Fold mixture together with a spatula until a silky smooth consistency is reached. It may take you a minute to work the chocolate mixture around the bowl and smooth out all the chunks of xylitol. Scrape melted chocolate bit by bit into ice cream maker a few minutes before the ice cream stiffens completely. Alternatively, pour on to a sheet pan lined with foil. 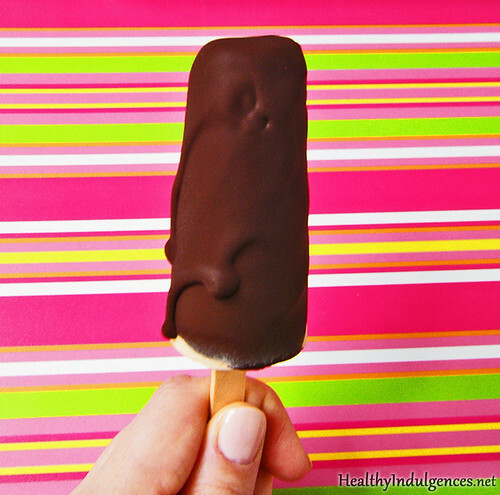 Freeze for 10 minutes, then peel chocolate slab off of foil. Chop into tiny chunks, working quickly before it melts. Fold chips into finished ice cream. What is your favorite kind of ice cream? Any good storebought sugar-free or dairy-free brands? Leave a comment and share your thoughts! 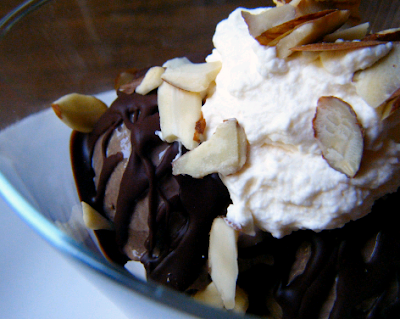 Low Carb Vanilla Ice Cream w/Hot Fudge Sauce–No Ice Cream Maker Required! Just a quick note about comments and emails–I have been traveling, and don’t always have a moment to respond to everything as of late. If you have an urgent question about a recipe, please shoot me an email (or two!). Keep in mind that I’m just a college student. Thanks so much for your feedback! I read all of it and take it to heart to improve the content here. It’s ice cream season in Florida! I’ve blogged about this frozen treat before, but couldn’t resist trying a couple of recipes that seemed pretty easy, with readily available ingredients. Best of all, they don’t require an ice cream maker, but still yield deliciously creamy, airy results. Furthermore, they’re company worthy, making summer entertaining easy on your low carb plan. Coming up for you are more ice cream recipes, now that I’m back home with my little Cuisinart ice cream maker. 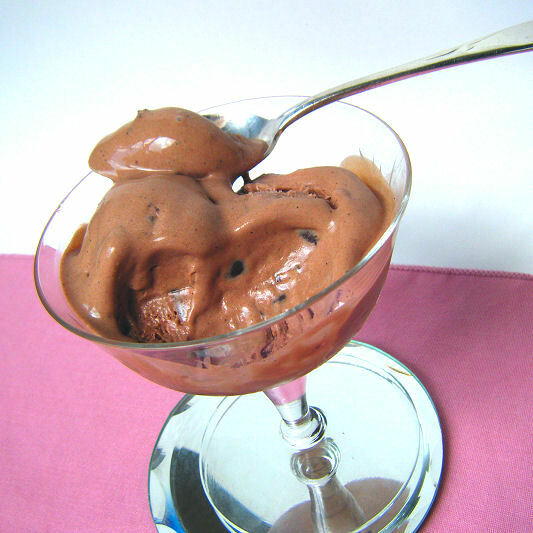 Stay tuned for a scoopable dairy-free ice cream, coming up next post. 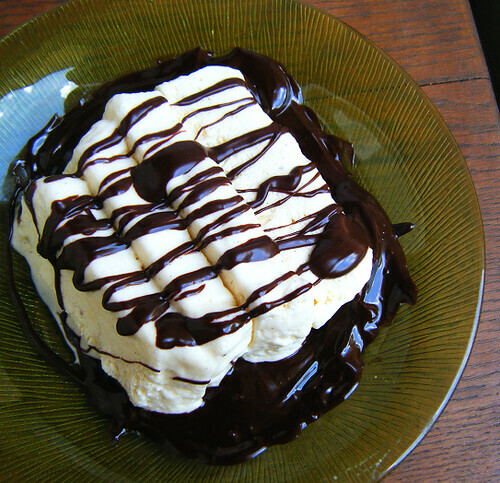 Do you know what a semifreddo is? 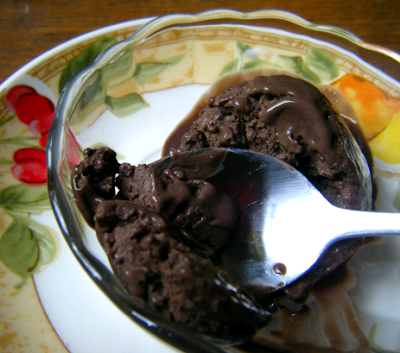 I had never heard of it until stumbling upon this Italian frozen dessert at a food blog. Semifreddo is italian for “half cold,” which aptly describes the nature of this icy gluten-free dessert. 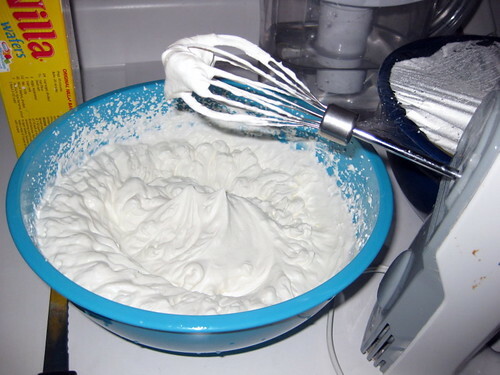 You whip together cream, separated eggs, sweetener and flavoring, then spread it in a loaf pan or mold. 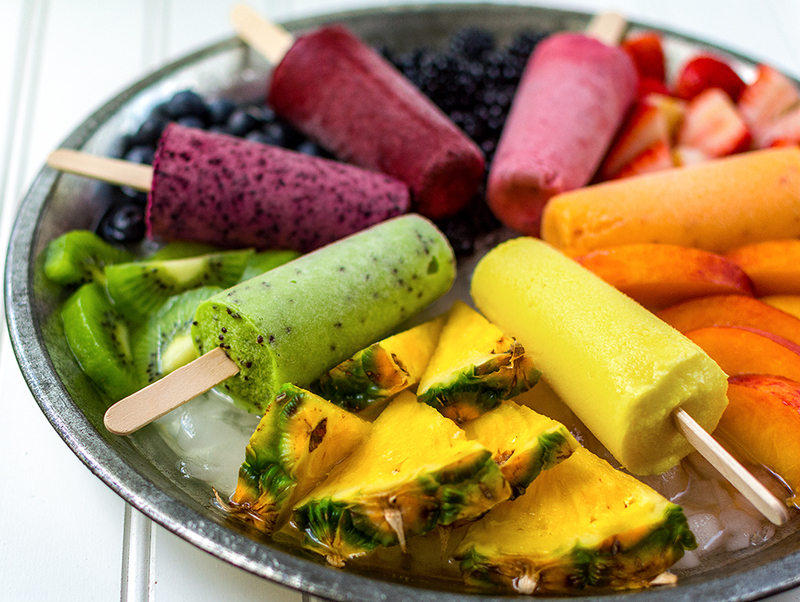 Freeze, slice, and enjoy. It’s that simple! All you need is a hand mixer and a few mixing bowls, along with a bit of patience for the whipping and freezing time required. 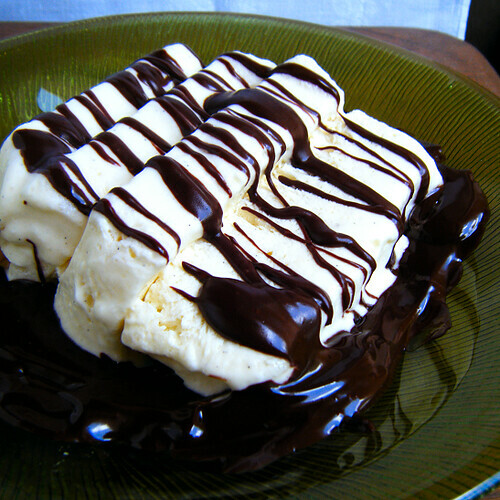 I topped off the vanilla bean version with a homemade sugar-free hot fudge sauce. It’s lick-off-the-spoon worthy. You can make up a small batch if you feel it’ll be dangerous to have hanging around. 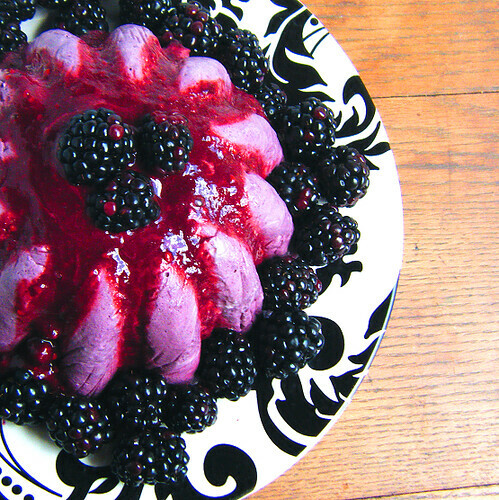 Seasonal blackberries were used in the making of the deep purple semifreddo. I blended ’em up, strained them, and used them in the custard as well as the fresh sauce drizzled over the top. The sauce helps to cover the cracks I made from using plastic wrap to line the mold. Note to self–don’t line the mold next time. Just grease it with butter, and run the mold under hot water if you want your pretty pan design to show on the finished dessert. 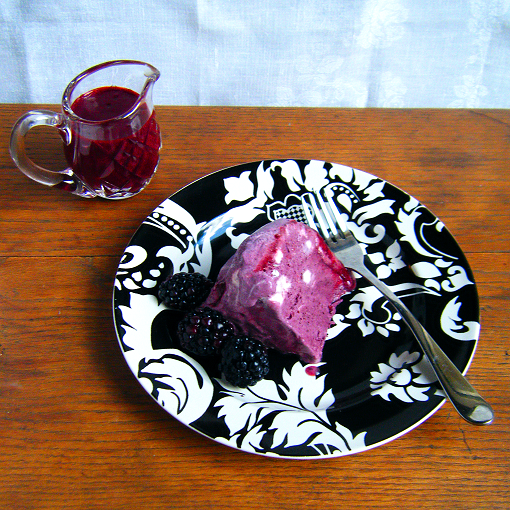 I used a jello mold for the blackberry flavor, which you can see created the rounded, fluted shape. How cool is the bright purple coloring from the blackberries? 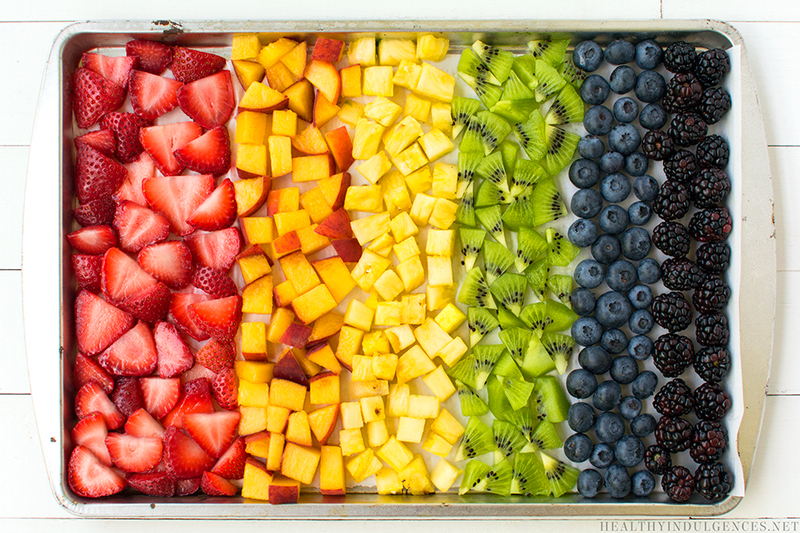 You just know something that naturally vibrant has to be healthy! 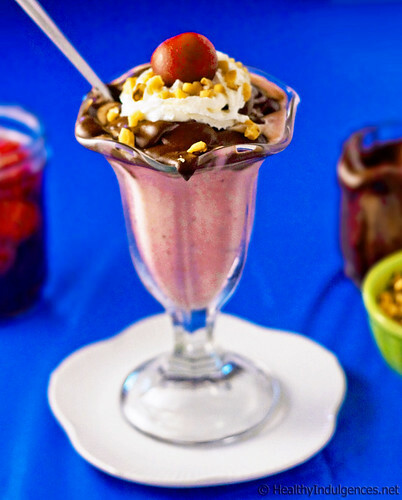 Tastes just like a hot fudge sundae! In first bowl, beat sugar and egg yolks until mixture is a light creamy yellow, then beat in vanilla extract and bean scrapings. In second bowl, beat heavy cream until soft peaks form. In third bowl, beat egg whites, add a pinch of salt, and then keep beating until you have stiff peaks. Fold together cream and egg yolk mixture gently. Then fold in egg whites thoroughly, but with as few strokes as possible to keep the airiness. Spread into loaf pan lined with plastic wrap, or a metal mold. Freeze, covered loosely in plastic wrap, for at least 4 hours. Scoop out with an ice cream scoop. Alternatively, run water over the bottom of the pan for a few seconds, unmold, and slice. This hot fudge sauce will not work will Splenda as the primary sweetener. No matter how much you add, the unsweetened chocolate will still taste better. You must add erythritol or xylitol for the best flavor. Powder xylitol or erythritol in coffee grinder with pinch of sea salt. Chop chocolate finely. Melt together unsweetened chocolate and butter in a double boiler, stirring occasionally until smooth. I make my own double boiler by placing my steel bowl over simmering water in a small saucepan. Stir in cream and sweetener mixture, and whisk until smooth. Remove from heat and add vanilla and water. Add more water to thin it out if necessary. Taste and adjust sweetness with a bit more stevia or powdered erythritol, as necessary. Keep in mind that the sauce will firm up over ice cream. Store in a jar in the refrigerator, and reheat and whisk well to use. Those little white flecks are bits of cream not mixed in well. Still tastes fabulous! Line loaf pan with plastic wrap, if using. Powder erythritol or xylitol in coffee grinder. Purée berries with 1/4 cup cream and salt in a blender until smooth. Pour through a mesh sieve to remove seeds, if desired. Add yolks to a metal bowl and stir in erythritol or xylitol (or Splenda). Set bowl over a saucepan of simmering water and beat with mixer until pale, thick, and tripled in volume, about 8 minutes. Remove bowl from saucepan and set in a large ice bath, stirring it around a few times as it cools. When yolks are cool to the touch, fold in berry puree. Beat cold heavy cream (with 1/8 teaspoon stevia, if using), in other large bowl, using cleaned beaters. Whip until cream reaches soft peaks. Fold whipped cream into berry mixture gently but thoroughly. Don’t worry if you see a few streaks of white. Scrape mixture into pan or decorate metal mold and freeze, loosely covered with plastic wrap, until firm, at least 5 hours. Run warm water over the bottom of the pan for a few seconds, then invert semifreddo onto a plate. Alternatively, just use an ice cream scoop to serve from the loaf pan. Let semifreddo defrost for a few minutes for easier scooping. 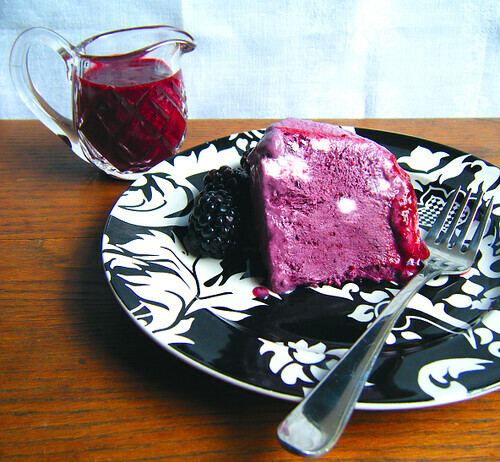 Blend blackberries, lemon juice, and sweetener until pureed. Strain through a sieve to remove seeds. It’s too chilly outside to walk to Whole Foods, and it’s so convenient shop on campus with our dining points. As luck would have it, two of my healthy cooking staples-coconut milk and extra dark chocolate–happen to be available at the coffee shop by my dorm building. I decided to make a comforting treat using truly “local” ingredients. With the swipe of my student I.D. card, I stocked up on my favorite Lindt 85% chocolate and canned coconut milk and pondered the possibilities. Even though NC has been cold enough to make me long for the dearth of seasonal weather that is southwest Florida, ice cream sounded really good yesterday afternoon. It may have had something to do with my friend wanting to stop at Ben and Jerry’s after a quiet dinner out at a delicious Mediterranean restaurant. I was pretty full that night from meat skewers with tzaziki and baba ghanoush, but for old times sake, we went into the colorful ice cream shop. I ended up getting a tiny Kid-sized scoop of their sugar-free ice cream, just to try it. A little processed food once in a blue moon when you’re out with a good friend can’t hurt. The Ben and Jerry’s experience was honestly a bit of a disappointment. The texture of the No Sugar Added Vanilla Fudge ice cream was grainy (because of the lowfat milk I’m guessing), had an aftertaste from the Splenda, and worst of all, caused the telltale tummy “rumbling” associated with maltitol. Fortunately, the scoop I had was small enough not to cause any side effects, but I was truly worried for a moment there. After tossing out the little paper cup and feeling cheated out of $4.50, I hatched a plan to make my own healthy ice cream. Without Splenda, skim milk, artificial flavorings, maltitol…. or an ice cream maker. 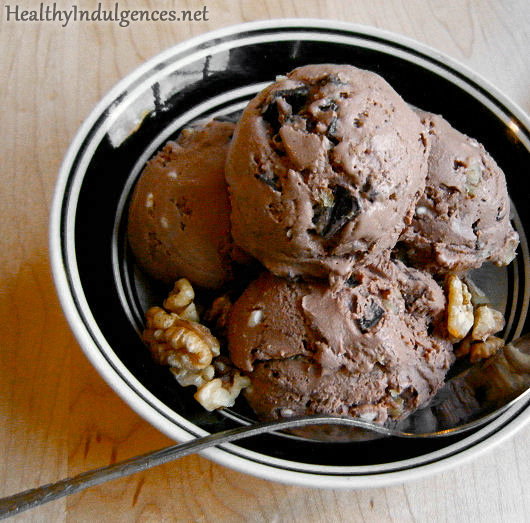 This sugar-free, dairy-free chocolate walnut ice cream turned out much better than I ever could have expected. 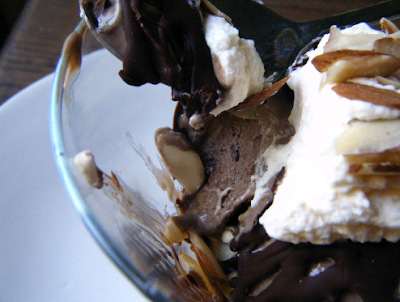 You just whip it up and freeze it in a dish… no ice cream machine required! 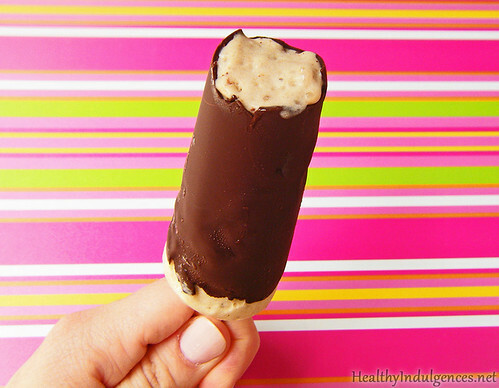 It’s rich, creamy, scoopable from the freezer, and pleasantly sweet. 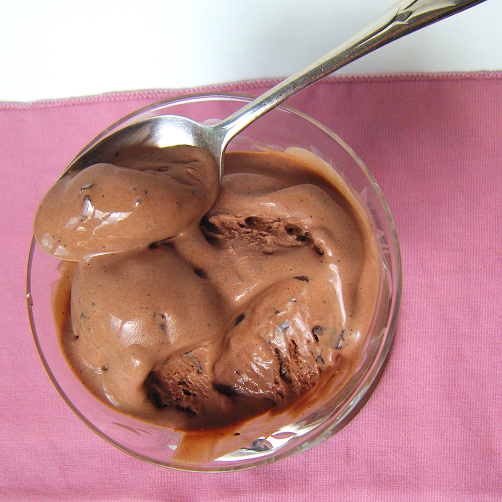 Forgo storebought low-carb ice cream and make up a batch of this. It’s even lower in carbs than the prepackaged kind because of the use of my favorite natural sweetener, erythritol (instead of sorbitol and maltitol which are higher on the glycemic index). The coconut milk imparts creaminess and a subtle flavor, while the coconut oil makes for a smooth mouthfeel. The fresh organic egg yolk emulsifies the whole mix into ice cold dairy-free bliss. 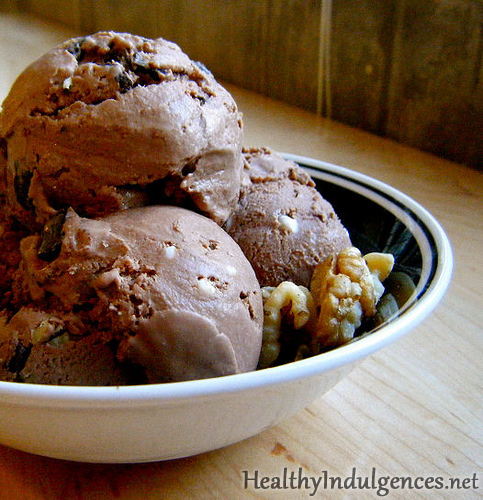 I added homemade low carb chocolate chunks that melt in your mouth as you eat the ice cream instead of staying cold hard bits (which always ruins the fun of chocolate chip ice cream for me). The walnuts add crunch. There’s also a spoonful of rum to make the ice cream stay soft enough to scoop. You can’t taste the alcohol, though. If you don’t mind your ice cream freezing very hard, simply leave it out. I must say that the rum was by far the most accessible ingredient since there are people turning 21 every day in my dorm hall! Melt together chocolate, erythritol, coconut milk, sea salt, coconut oil, and microwave on HIGH for 30-40 seconds until chocolate and coconut oil are melted. 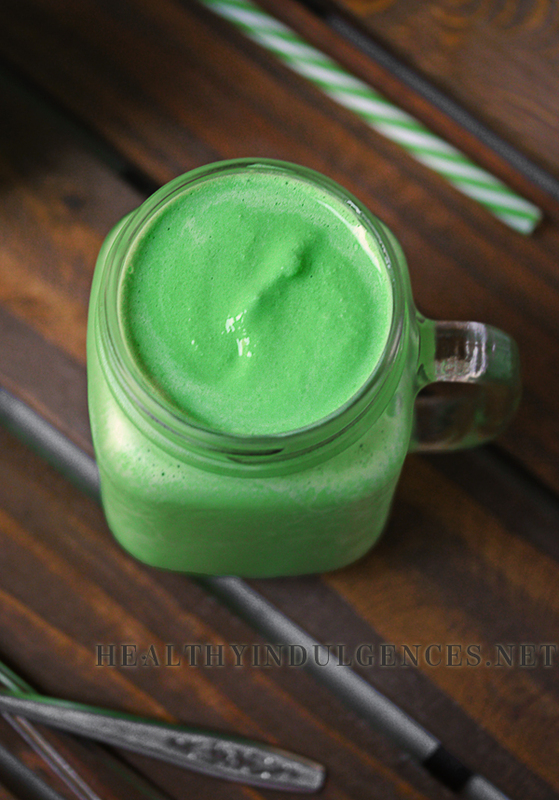 Blend with stevia, rum, and vanilla until smooth. Add the egg yolk and blend once more. Pour into a glass dish and cover tightly with plastic wrap. Freeze for one hour, then remove from freezer and whisk vigorously. Stir once more after another hour, adding in the walnuts and chips. I let mine freeze overnight. You could also just pour the mix into an ice cream maker and freeze per your manufacturer’s instructions. Powder erythritol or xylitol in coffee grinder or magic bullet. Melt chocolate with powdered sweetener and shortening. Stir in a pinch of stevia and taste for sweetness. Spread in a thin layer onto a sheet of wax paper or aluminum foil and freeze until set. Chop into small square chunks. Keep chilled. Every once in awhile I think I have an original, particularly ground-breaking idea. 99% of the time, that isn’t the case. This is one of those ideas that gave me false hope. Oh well, it was fun feeling creative until some googling showed me this link to Jessica Su’s cottage cheese ice cream at her Su Good Sweets blog (WARNING: NOT low carb). Do I get points for making it sugar-free and all natural? This one goes out to the body builders, PSMFers, and those with gall bladder issues (love you, Mom!). Fool your friends with this creamy, delicious frozen treat that’s low cal, low sugar, and guilt-free. It doesn’t taste like cottage cheese, honest! My faithful testers weren’t able to detect anything except lemony goodness, although one of them made a face after I revealed the secret ingredient. You don’t have to portion control here, since a 1/2 cup serving has 90 tiny calories and 5 grams of carbs! It’s basically the most delicious way ever to get in a whopping 18 grams of protein and 15% of your RDA of calcium (I’m looking at you, vegetarians!) 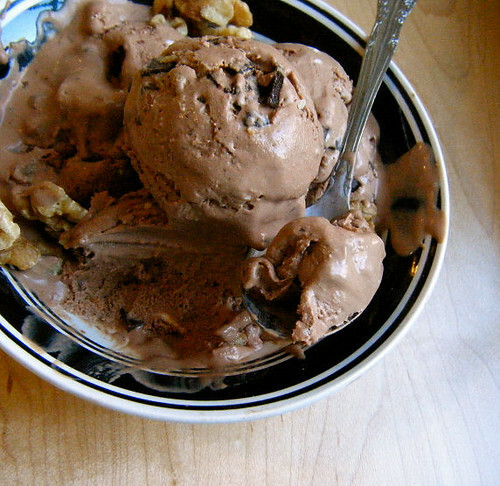 Yes, you can have ice cream while losing weight and eating for optimal health. Be sure to look for a cottage cheese without scary additives. Gum thickeners are pretty natural, but the phrase “artificial flavors” is probably a bad sign. Use full-fat or low fat cottage cheese if you’re not watching your calories. I like Organic Valley products–no hormones! If organic cottage cheese doesn’t fit into your budget, Friendship 1% blends up nice and creamy with no strange additives. If all else fails, compare labels and pick the one with the lowest sodium content–the saltiness is noticeable, especially with the lemon flavor. You don’t have to fear dietary salt, but some people are more sensitive to the taste than I am. Did you know it’s actually more dangerous to eat a low sodium diet than it is to just eat how your tastebuds tell you to? Bust out your old ice cream maker (or find a nifty automatic model on Craig’s List like I did) and get ready to be amazed. 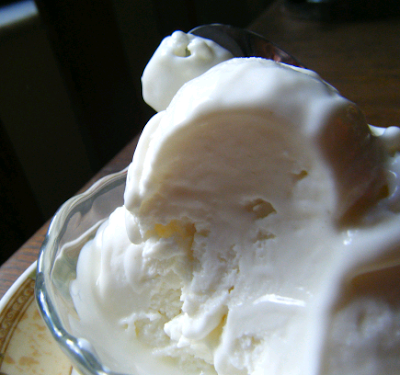 Even if you are enjoying your low carb cream n’ egg yolk based ice cream, give cottage cheese ice cream a fair chance. The protein is very satisfying, so it’s a wee bit easier to portion control than the best ice cream recipe in the world by my man, Alton Brown (low carb tweaks coming soon!). 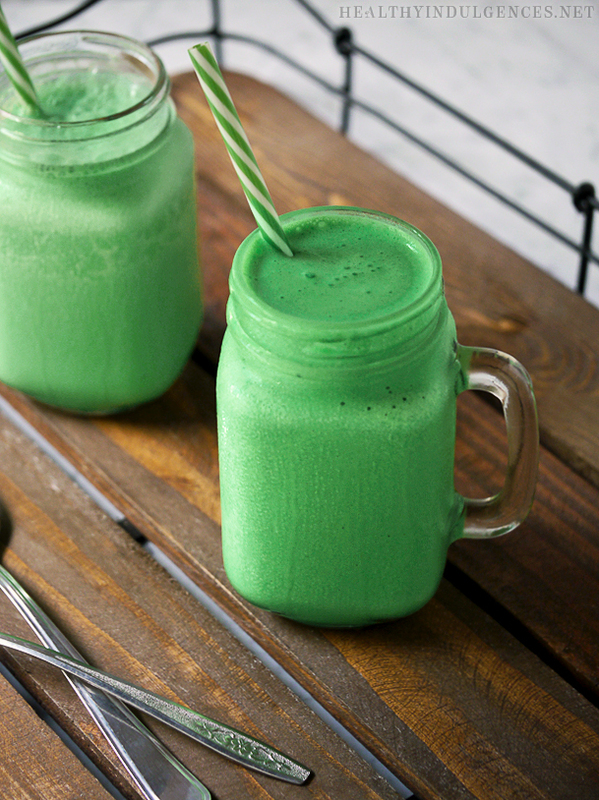 Combine ingredients in a blender or magic bullet. Puree until smooth and free of lumps, scraping down the food processor a few times. Freeze according to your ice cream manufacturer’s directions. 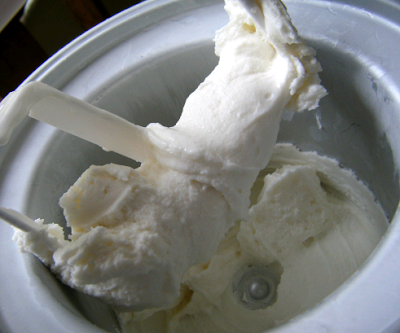 Store in a tupperware container in your freezer and consume immediately, or within two hours of making your ice cream. It turns into an icy rock beyond that point (unless you add a tablespoon of vodka to the mix). You can always pop the container in the microwave for a few seconds to defrost. This is all that was left of the chocolate almond! After making many batches of my ice cream bars, I got sick of the peanut butter flavor and wanted something more creamy and spoonable for my fix. More traditional. Ice cream is still my first love in terms of treats. Nothing can replace the milky cold sweetness of it, and during summer time the feelings of longing are the strongest. Fortunately, I can’t remember the last time I caved to the craving and stopped at a DQ for a blizzard. And if you have this quick and dirty ice cream sitting in your freezer, you won’t have to think twice about it. It’s thick and creamy, just like you remember. And the best part? No fancy machinery required! This sugar-free, all natural ice cream made with luxuriously thick ricotta cheese will give you 50% of your RDA of calcium per half cup serving, and contains 4 measly carbs. Use your favorite minimally processed cocoa powder for an antioxidant boost. I’ll admit to using Hershey’s Special Dark Cocoa for that Wendy’s frosty chocolate flavoring, but the non-Dutched stuff is best for the preservation of nutrients. Blend ricotta, egg yolk, cocoa powder, vanilla extract, sweeteners, xanthan gum, and other flavorings together in a blender or food processor until totally smooth. Stir in nuts and chocolate shavings if desired. Pour into plastic tub with a lid and freeze for an hour, stirring well every 20 minutes to break up the ice so it freezes properly. Serve as soon as it’s frozen enough to be scoopable. If you decide not to eat it immediately, let it sit out for 10 minutes when you remove it from the freezer before serving. ~5g net carbs per serving! 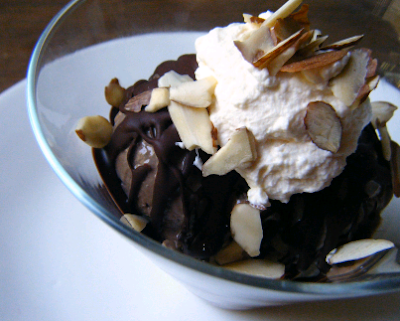 Topped with hard shell topping, fresh whipped cream, and slivered almonds. Best lunch EVER. Nuke chocolate and coconut oil together, stirring at 20 seconds intervals until smooth. Stir in cream and sweeteners, tasting and adjusting if necessary. Give it a try! If you have a flavor idea, let me know about it and we can work on re-creating it.